Not to be confused with Ulysses (poem). Ulysses is a modernist novel by Irish writer James Joyce. It was first serialised in parts in the American journal The Little Review from March 1918 to December 1920, and then published in its entirety by Sylvia Beach in February 1922, in Paris. It is considered to be one of the most important works of modernist literature, and has been called "a demonstration and summation of the entire movement". According to Declan Kiberd, "Before Joyce, no writer of fiction had so foregrounded the process of thinking." Ulysses chronicles the peripatetic appointments and encounters of Leopold Bloom in Dublin in the course of an ordinary day, 16 June 1904. Ulysses is the Latinised name of Odysseus, the hero of Homer's epic poem Odyssey, and the novel establishes a series of parallels between the poem and the novel, with structural correspondences between the characters and experiences of Leopold Bloom and Odysseus, Molly Bloom and Penelope, and Stephen Dedalus and Telemachus, in addition to events and themes of the early twentieth century context of modernism, Dublin, and Ireland's relationship to Britain. The novel imitates registers of centuries of English literature and is highly allusive. Ulysses is approximately 265,000 words in length and is divided into eighteen episodes. Since publication, the book has attracted controversy and scrutiny, ranging from early obscenity trials to protracted textual "Joyce Wars". Ulysses' stream-of-consciousness technique, careful structuring, and experimental prose — full of puns, parodies, and allusions — as well as its rich characterisation and broad humour, made the book a highly regarded novel in the modernist pantheon. Joyce fans worldwide now celebrate 16 June as Bloomsday. Joyce first encountered the figure of Odysseus/Ulysses in Charles Lamb's Adventures of Ulysses—an adaptation of the Odyssey for children, which seemed to establish the Roman name in Joyce's mind. At school he wrote an essay on the character, entitled "My Favourite Hero". Joyce told Frank Budgen that he considered Ulysses the only all-round character in literature. He thought about calling his short-story collection Dubliners by the name Ulysses in Dublin, but the idea grew from a story in Dubliners in 1906, to a "short book" in 1907, to the vast novel that he began in 1914. Post office, Westland Row - Episode 5, Lotus Eaters. Joyce divided Ulysses into 18 episodes. At first glance much of the book may appear unstructured and chaotic; Joyce once said that he had "put in so many enigmas and puzzles that it will keep the professors busy for centuries arguing over what I meant", which would earn the novel immortality. The two schemata which Stuart Gilbert and Herbert Gorman released after publication to defend Joyce from the obscenity accusations made the links to the Odyssey clear, and also explained the work's internal structure. Every episode of Ulysses has a theme, technique and correspondence between its characters and those of the Odyssey. The original text did not include these episode titles and the correspondences; instead, they originate from the Linati and Gilbert schemata. Joyce referred to the episodes by their Homeric titles in his letters. He took the idiosyncratic rendering of some of the titles, e.g. "Nausikaa" and the "Telemachiad" from Victor Bérard's two-volume Les Phéniciens et l'Odyssée which he consulted in 1918 in the Zentralbibliothek Zürich. It is 8 a.m. Buck Mulligan, a boisterous medical student, calls Stephen Dedalus (a young writer encountered as the principal subject of A Portrait of the Artist as a Young Man) up to the roof of the Sandycove Martello tower where they both live. There is tension between Stephen and Mulligan, stemming from a cruel remark Stephen has overheard Mulligan making about his recently deceased mother, May Dedalus, and from the fact that Mulligan has invited an English student, Haines, to stay with them. The three men eat breakfast and walk to the shore, where Mulligan demands from Stephen the key to the tower and a loan. Departing, Stephen declares that he will not return to the tower tonight, as Mulligan, the "usurper", has taken it over. Stephen is teaching a history class on the victories of Pyrrhus of Epirus. After class, one student, Cyril Sargent, stays behind so that Stephen can show him how to do a set of arithmetic exercises. Stephen looks at the aesthetically unappealing Sargent and tries to imagine Sargent's mother's love for him. Stephen then visits school headmaster Garrett Deasy, from whom he collects his pay and a letter to take to a newspaper office for printing. The two discuss Irish history and the role of Jews in the economy. As Stephen leaves, Deasy makes a final derogatory remark against the Jews, stating that Ireland has never extensively persecuted the Jews because they were never let in to the country. This episode is the source of some of the novel's most famous lines, such as Dedalus's claim that "history is a nightmare from which I am trying to awake" and that God is "a shout in the street." Stephen finds his way to Sandymount Strand and mopes around for some time, mulling various philosophical concepts, his family, his life as a student in Paris, and his mother's death. As Stephen reminisces and ponders, he lies down among some rocks, watches a couple and a dog, scribbles some ideas for poetry, picks his nose and urinates behind a rock. This chapter is characterised by a stream of consciousness narrative style that changes focus wildly. Stephen's education is reflected in the many obscure references and foreign phrases employed in this episode, which have earned it a reputation for being one of the book's most difficult chapters. The narrative shifts abruptly. The time is again 8 am, but the action has moved across the city and to the second protagonist of the book, Leopold Bloom, a part-Jewish advertising canvasser. Bloom, after starting to prepare breakfast, decides to walk to a butcher to buy a pork kidney. Returning home, he prepares breakfast and brings it with the mail to his wife Molly as she lounges in bed. One of the letters is from her concert manager Blazes Boylan. Bloom is aware that Molly will welcome Boylan into her bed later that day, and is tormented by the thought. Bloom reads a letter from their daughter Milly Bloom. The chapter closes with Bloom defecating in the outhouse. Bloom makes his way to Westland Row post office where he receives a love letter from one 'Martha Clifford' addressed to his pseudonym, 'Henry Flower'. He meets an acquaintance, and while they chat, Bloom attempts to ogle a woman wearing stockings, but is prevented by a passing tram. Next, he reads the letter and tears up the envelope in an alley. He wanders into a Catholic church service and muses on theology. The priest has the letters I.N.R.I. or I.H.S. on his back; Molly had told Bloom that they meant I have sinned or I have suffered, and Iron nails ran in. He goes to a chemist where he buys a bar of lemon soap. He then meets another acquaintance, Bantam Lyons, who mistakenly takes him to be offering a racing tip for the horse Throwaway. Finally, Bloom heads towards the baths. The episode begins with Bloom entering a funeral carriage with three others, including Stephen's father. They drive to Paddy Dignam's funeral, making small talk on the way. The carriage passes both Stephen and Blazes Boylan. There is discussion of various forms of death and burial, and Bloom is preoccupied by thoughts of his dead son, Rudy, and the suicide of his own father. They enter the chapel into the service and subsequently leave with the coffin cart. Bloom sees a mysterious man wearing a mackintosh during the burial. Bloom continues to reflect upon death, but at the end of the episode rejects morbid thoughts to embrace 'warm fullblooded life'. At the office of the Freeman's Journal, Bloom attempts to place an ad. Although initially encouraged by the editor, he is unsuccessful. Stephen arrives bringing Deasy's letter about 'foot and mouth' disease, but Stephen and Bloom do not meet. Stephen leads the editor and others to a pub, relating an anecdote on the way about 'two Dublin vestals'. The episode is broken into short segments by newspaper-style headlines, and is characterised by an abundance of rhetorical figures and devices. Bloom's thoughts are peppered with references to food as lunchtime approaches. He meets an old flame and hears news of Mina Purefoy's labour. He enters the restaurant of the Burton Hotel where he is revolted by the sight of men eating like animals. He goes instead to Davy Byrne's pub, where he consumes a gorgonzola cheese sandwich and a glass of burgundy, and muses upon the early days of his relationship with Molly and how the marriage has declined: 'Me. And me now.' Bloom's thoughts touch on what goddesses and gods eat and drink. He ponders whether the statues of Greek goddesses in the National Museum have anuses as do mortals. On leaving the pub Bloom heads toward the museum, but spots Boylan across the street and, panicking, rushes into the gallery across the street from the museum. At the National Library, Stephen explains to various scholars his biographical theory of the works of Shakespeare, especially Hamlet, which he claims are based largely on the posited adultery of Shakespeare's wife. Bloom enters the National Library to look up an old copy of the ad he has been trying to place. He encounters Stephen briefly and unknowingly at the end of the episode. In this episode, nineteen short vignettes depict the wanderings of various characters, major and minor, through the streets of Dublin. The episode ends with an account of the cavalcade of the Lord Lieutenant of Ireland, William Ward, Earl of Dudley, through the streets, which is encountered by various characters from the novel. This chapter is narrated by an unnamed denizen of Dublin. The narrator goes to Barney Kiernan's pub where he meets a character referred to only as "The Citizen". When Leopold Bloom enters the pub, he is berated by the Citizen, who is a fierce Fenian and anti-Semite. The episode ends with Bloom reminding the Citizen that his Saviour was a Jew. As Bloom leaves the pub, the Citizen, in anger, throws a biscuit tin at Bloom's head, but misses. The chapter is marked by extended tangents made in voices other than that of the unnamed narrator: these include streams of legal jargon, Biblical passages, and elements of Irish mythology. Gerty MacDowell, a young woman on Sandymount strand, contemplates love, marriage and femininity as night falls. The reader is gradually made aware that Bloom is watching her from a distance, and as she exposes her legs and underwear to him it is unclear how much of the narrative is actually Bloom’s sexual fantasy. Bloom’s masturbatory climax is echoed by the fireworks at the nearby bazaar. As Gerty leaves, Bloom realises that she has a lame leg. After several digressions of thought he decides to visit Mina Purefoy at the hospital. The style of the first half of the episode borrows from (and parodies) romance magazines and novelettes. Bloom visits the maternity hospital where Mina Purefoy is giving birth, and finally meets Stephen, who has been drinking with his medical student friends and is awaiting the promised arrival of Buck Mulligan. They continue on to a pub to continue drinking, following the successful birth of the baby. This chapter is remarkable for Joyce's wordplay, which, among other things, recapitulates the entire history of the English language. After a short incantation, the episode starts with latinate prose, Anglo-Saxon alliteration, and moves on through parodies of, among others, Malory, the King James Bible, Bunyan, Defoe, Sterne, Walpole, Gibbon, Dickens, and Carlyle, before concluding in a haze of nearly incomprehensible slang. Episode 15 is written as a play script, complete with stage directions. The plot is frequently interrupted by "hallucinations" experienced by Stephen and Bloom—fantastic manifestations of the fears and passions of the two characters. Stephen and Lynch walk into Nighttown, Dublin's red-light district. Bloom pursues them and eventually finds them at Bella Cohen's brothel, where in the company of her workers including Zoe Higgins, Florry Talbot and Kitty Ricketts he has a series of hallucinations regarding his sexual fetishes, fantasies, and transgressions. Bloom is put in the dock to answer charges by a variety of sadistic, accusing women including Mrs Yelverton Barry, Mrs Bellingham and The Hon Mrs Mervyn Talboys. When Bloom witnesses Stephen overpaying for services received, Bloom decides to hold onto the rest of Stephen's money for safekeeping. Stephen hallucinates that the rotting cadaver of his mother has risen up from the floor to confront him. Terrified, Stephen uses his walking stick to smash a chandelier and then runs out. Bloom quickly pays Bella for the damage, then runs after Stephen. Bloom finds Stephen engaged in a heated argument with an English soldier, Private Carr, who, after a perceived insult to the King, punches Stephen. The police arrive and the crowd disperses. As Bloom is tending to Stephen, Bloom has a hallucination of Rudy, his deceased child. Bloom and Stephen go to the cabman's shelter to restore the latter to his senses. At the cabman's shelter, they encounter a drunken sailor named D. B. Murphy (W. B. Murphy in the 1922 text). The episode is dominated by the motif of confusion and mistaken identity, with Bloom, Stephen and Murphy's identities being repeatedly called into question. The rambling and laboured style of the narrative in this episode reflects the nervous exhaustion and confusion of the two protagonists. Bloom returns home with Stephen, makes him a cup of cocoa, discusses cultural and lingual differences between them, considers the possibility of publishing Stephen's parable stories, and offers him a place to stay for the night. Stephen refuses Bloom's offer and is ambiguous about Bloom's proposal of future meetings. The two men urinate in the backyard, Stephen departs and wanders off into the night, and Bloom goes to bed, where Molly is sleeping. She awakens and questions him about his day. The episode is written in the form of a rigidly organised and "mathematical" catechism of 309 questions and answers, and was reportedly Joyce's favourite episode in the novel. The deep descriptions range from questions of astronomy to the trajectory of urination and include a famous list of 25 men perceived as Molly's lovers (apparently corresponding to the suitors slain at Ithaca by Odysseus and Telemachus in The Odyssey), including Boylan, and Bloom's psychological reaction to their assignation. While describing events apparently chosen randomly in ostensibly precise mathematical or scientific terms, the episode is rife with errors made by the undefined narrator, many or most of which are volitional by Joyce. The final episode consists of Molly Bloom's thoughts as she lies in bed next to her husband. The episode uses a stream-of-consciousness technique in eight sentences and lacks punctuation. Molly thinks about Boylan and Bloom, her past admirers, including Lieutenant Stanley G. Gardner, the events of the day, her childhood in Gibraltar, and her curtailed singing career. These thoughts are occasionally interrupted by distractions, such as a train whistle or the need to urinate. The episode famously concludes with Molly's remembrance of Bloom's marriage proposal, and of her acceptance: "he asked me would I yes to say yes my mountain flower and first I put my arms around him yes and drew him down to me so he could feel my breasts all perfume yes and his heart was going like mad and yes I said yes I will Yes." 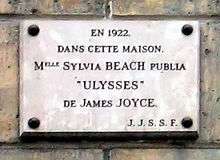 Memorial plaque, at 12 Rue de l'Odéon, Paris saying that "In 1922 Sylvia Beach published James Joyce's Ulysses in this house. ", original location of Shakespeare & Co. The publication history of Ulysses is complex. There have been at least 18 editions, and variations in different impressions of each edition. According to Joyce scholar Jack Dalton, the first edition of Ulysses contained over two thousand errors but was still the most accurate edition published. As each subsequent edition attempted to correct these mistakes, it incorporated more of its own, a task made more difficult by deliberate errors (See "Episode 17, Ithaca" above) devised by Joyce to challenge the reader. the Gabler critical and synoptic edition of 1984. Hans Walter Gabler's 1984 edition was the most sustained attempt to produce a corrected text, but it received much criticism, most notably from John Kidd. Kidd's main theoretical criticism is of Gabler's choice of a patchwork of manuscripts as his copy-text (the base edition with which the editor compares each variant), but this fault stems from an assumption of the Anglo-American tradition of scholarly editing rather than the blend of French and German editorial theories that actually lay behind Gabler's reasoning. The choice of a multiple copy-text is seen to be problematic in the eyes of some American editors, who generally favour the first edition of any particular work as copy-text. Less subject to differing national editorial theories, however, is the claim that for hundreds of pages—about half the episodes of Ulysses—the extant manuscript is purported to be a "fair copy" which Joyce made for sale to a potential patron. (As it turned out, John Quinn, the Irish-American lawyer and collector, purchased the manuscript.) Diluting this charge somewhat is the fact that the theory of (now lost) final working drafts is Gabler's own. For the suspect episodes, the existing typescript is the last witness. Gabler attempted to reconstruct what he called "the continuous manuscript text", which had never physically existed, by adding together all of Joyce's accretions from the various sources. This allowed Gabler to produce a "synoptic text" indicating the stage at which each addition was inserted. Kidd and even some of Gabler's own advisers believe this method meant losing Joyce's final changes in about two thousand places. Far from being "continuous", the manuscripts seem to be opposite. Jerome McGann describes in detail the editorial principles of Gabler in his article for the journal Criticism, issue 27, 1985. In the wake of the controversy, still other commentators charged that Gabler's changes were motivated by a desire to secure a fresh copyright and another seventy-five years of royalties beyond a looming expiration date. In June 1988 John Kidd published "The Scandal of Ulysses" in the New York Review of Books, charging that not only did Gabler's changes overturn Joyce's last revisions, but in another four hundred places Gabler failed to follow any manuscript whatever, making nonsense of his own premises. Kidd accused Gabler of unnecessarily changing Joyce's spelling, punctuation, use of accents, and all the small details he claimed to have been restoring. Instead, Gabler was actually following printed editions such as that of 1932, not the manuscripts. More sensationally, Gabler was found to have made genuine blunders, the most famous being his changing the name of the real-life Dubliner Harry Thrift to 'Shrift' and cricketer Captain Buller to 'Culler' on the basis of handwriting irregularities in the extant manuscript. (These "corrections" were undone by Gabler in 1986.) Kidd stated that many of Gabler's errors resulted from Gabler's use of facsimiles rather than original manuscripts. In December 1988, Charles Rossman's "The New Ulysses: The Hidden Controversy" for the New York Review revealed that Gabler's own advisers felt too many changes were being made, but that the publishers were pushing for as many alterations as possible. Then Kidd produced a 174-page critique that filled an entire issue of the Papers of the Bibliographical Society of America, dated the same month. This "Inquiry into Ulysses: The Corrected Text" was the next year published in book format and on floppy disk by Kidd's James Joyce Research Center at Boston University. Gabler and others rejected Kidd's critique, and the scholarly community remains divided. In 1990, Gabler's American publisher Random House, after consulting a committee of scholars, replaced the Gabler edition with its 1961 version, and in the United Kingdom the Bodley Head press revived its 1960 version. In both the UK and USA, Everyman's Library also republished the 1960 Ulysses. In 1992, Penguin dropped Gabler and reprinted the 1960 text. The Gabler version remained available from Vintage International. Reprints of the 1922 first edition are also now widely available, largely due to the expiration of the copyright for that edition in the United States. While much ink has been spilt over the faults and theoretical underpinnings of the Gabler edition, the long-awaited Kidd edition has yet to be published, as of 2015. In 1992 W. W. Norton announced that a Kidd edition of Ulysses was to be published as part of a series called "The Dublin Edition of the Works of James Joyce". This book had to be withdrawn, however, when the Joyce estate objected. The estate refused to authorise any further editions of Joyce's work for the immediate future, but signed a deal with Wordsworth Editions to bring out a bargain version of the novel in January 2010, ahead of copyright expiration in 2012. Written over a seven-year period from 1914 to 1921, the novel was serialised in the American journal The Little Review from 1918 to 1920, when the publication of the Nausicaä episode led to a prosecution for obscenity. In 1919, sections of the novel also appeared in the London literary journal The Egoist, but the novel itself was banned in the United Kingdom until the 1930s. Joyce had resolved that the book would be published on his fortieth birthday, 2 February 1922, and Sylvia Beach, Joyce's publisher in Paris, received the first three copies from the printer that morning. The 1920 prosecution in the US was brought after The Little Review serialised a passage of the book dealing with the main character masturbating. Legal historian Edward de Grazia has argued that few readers would have been fully aware of the orgasmic experience in the text, given the metaphoric language. Irene Gammel extends this argument to suggest that the obscenity allegations brought against The Little Review were influenced by the Baroness Elsa von Freytag-Loringhoven's more explicit poetry, which had appeared alongside the serialization of Ulysses. The New York Society for the Suppression of Vice, which objected to the book's content, took action to attempt to keep the book out of the United States. At a trial in 1921 the magazine was declared obscene and, as a result, Ulysses was effectively banned in the United States. Throughout the 1920s, the United States Post Office Department burned copies of the novel. In 1933, the publisher Random House and lawyer Morris Ernst arranged to import the French edition and have a copy seized by customs when the ship was unloaded. The publisher contested the seizure, and in United States v. One Book Called Ulysses, U.S. District Judge John M. Woolsey ruled that the book was not pornographic and therefore could not be obscene, a decision that was called "epoch-making" by Stuart Gilbert. The Second Circuit Court of Appeals affirmed the ruling in 1934. The US therefore became the first English-speaking country where the book was freely available. Although Ulysses was never banned in Ireland, neither was it available there. In a review in The Dial, T. S. Eliot said of Ulysses: "I hold this book to be the most important expression which the present age has found; it is a book to which we are all indebted, and from which none of us can escape." He went on to assert that Joyce was not at fault if people after him did not understand it: "The next generation is responsible for its own soul; a man of genius is responsible to his peers, not to a studio full of uneducated and undisciplined coxcombs." The book has its critics. Virginia Woolf stated that "Ulysses was a memorable catastrophe—immense in daring, terrific in disaster." Karl Radek called Ulysses "a heap of dung, crawling with worms, photographed by a cinema camera through a microscope". One newspaper pundit stated it contained "secret sewers of vice . . . canalized in its flood of unimaginable thoughts, images, and pornographic words" and "revolting blasphemies" which "debases and perverts and degrades the noble gift of imagination and wit and lordship of language". Similar opinions on the proper role of literature were expressed by a dissenting appellate judge in the U.S. obscenity case which found that the book was not obscene: After suggesting that Joyce was given to "obscenity or lustful thoughts" and "[had] no Master", the judge stated that literature should serve the need of the people for "a moral standard", be "noble and lasting", and "cheer, console, purify, or enoble the life of people". "What is so staggering about Ulysses is the fact that behind a thousand veils nothing lies hidden; that it turns neither toward the mind nor toward the world, but, as cold as the moon looking on from cosmic space, allows the drama of growth, being, and decay to pursue its course." Joyce uses metaphors, symbols, ambiguities, and overtones which gradually link themselves together so as to form a network of connections binding the whole work. This system of connections gives the novel a wide, more universal significance, as "Leopold Bloom becomes a modern Ulysses, an Everyman in a Dublin which becomes a microcosm of the world." Eliot described this system as the "mythic method": "a way of controlling, of ordering, of giving a shape and a significance to the immense panorama of futility and anarchy which is contemporary history". Ulysses in Nighttown, based on Episode 15 ("Circe"), premiered off-Broadway in 1958, with Zero Mostel as Bloom; it debuted on Broadway in 1974. In 2006, playwright Sheila Callaghan's Dead City, a contemporary stage adaptation of the book set in New York City, and featuring the male figures Bloom and Dedalus re-imagined as female characters Samantha Blossom and Jewel Jupiter, was produced in Manhattan by New Georges. In 2013, a new stage adaptation of the novel, Gibraltar, was produced in New York by the Irish Repertory Theatre. It was written by and starred Patrick Fitzgerald and directed by Terry Kinney. This two-person play focused on the love story of Bloom and Molly, played by Cara Seymour. In 1967, a film version of the book was directed by Joseph Strick. Starring Milo O'Shea as Bloom, it was nominated for an Academy Award for Best Adapted Screenplay. In 2003, a movie version Bloom was released starring Stephen Rea and Angeline Ball. In 1988, a documentary, the episode "James Joyce's Ulysses" in a series titled The Modern World: Ten Great Writers, was shown on Channel 4, where some of the most famous scenes from the novel were dramatised. David Suchet played Leopold Bloom. On Bloomsday 1982, RTÉ, Ireland's national broadcaster, aired a full-cast, unabridged, dramatised radio production of Ulysses, that ran uninterrupted for 29 hours and 45 minutes. BBC Radio broadcast a highly abridged dramatisation of Ulysses read by Sinéad Cusack, James Greene, Stephen Rea, Norman Rodway, and others in 1993. It had a running time of 5 hours and 50 minutes. The unabridged text of Ulysses has been performed by Jim Norton, with Marcella Riordan. This recording was released by Naxos Records on 22 audio CDs in 2004. It follows an earlier abridged recording with the same actors. On Bloomsday 2010, author Frank Delaney launched a series of short weekly podcasts called Re:Joyce that take listeners through Ulysses page-by-page discussing its allusions, historical context and references. BBC Radio 4 aired a new nine-part adaptation dramatised by Robin Brooks and produced/directed by Jeremy Mortimer, and starring Stephen Rea as the Narrator, Henry Goodman as Leopold Bloom, Niamh Cusack as Molly Bloom and Andrew Scott as Stephen Dedalus, for Bloomsday 2012, beginning on 16 June 2012. The song "ReJoyce", by Grace Slick (originally released on Jefferson Airplane's 1967 album After Bathing at Baxter's), may be taken as a condensed (and fragmentary) musical evocation of Molly Bloom's soliloquy. While the song includes allusions and themes not obviously related, clear references are made to numerous characters and situations from the novel. Notably, while Joyce's Molly ends her soliloquy in the affirmative, Grace's "Molly", having mused over the conditions of her life in a way similar to Joyce's, concludes with the stoically despairing "it all falls apart." The song "Flower of the Mountain" by Kate Bush (originally the eponymous track off The Sensual World) sets to music the end of Molly Bloom's soliloquy. The Joyce novel is mentioned in the lyrics of the title track of Ulysses, a 2014 album by Canadian indie rock band Current Swell. The album cover art is also an homage to the first edition cover of the book. The novel is also directly alluded to by indie folk singer Mason Jennings in his song entitled "Ulysses", on his 2004 album Use Your Voice. Crystal Castles' 2009 self-titled album uses Episode 11 ("Sirens") as a basis for the lyrics to the track "Air War." Jacob Appel's novel, The Biology of Luck (2013), is a retelling of Ulysses set in New York City. The novel features an inept tour guide, Larry Bloom, whose adventures parallel those of Leopold Bloom through Dublin. ↑ Kiberd, Declan (16 June 2009). "Ulysses, modernism's most sociable masterpiece". The Guardian. London. Retrieved 28 June 2011. ↑ Menand, Louis (2 July 2012). "Silence, exile, punning". The New Yorker. 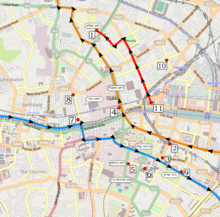 16 June 2014 is the date of Joyce's first outing with his wife-to-be, Nora Barnacle; they walked to the Dublin suburb of Ringsend, where Nora masturbated him. ↑ Vora, Avinash (20 October 2008). "Analyzing Ulysses". Retrieved 2008-10-20. ↑ Jaurretche, Colleen (2005). Beckett, Joyce and the art of the negative. European Joyce studies. 16. Rodopi. p. 29. ISBN 978-90-420-1617-0. Retrieved February 1, 2011. ↑ "The bookies' Booker...". The Observer. London. 5 November 2000. Retrieved 2002-02-16. ↑ Text of Ulysses; search for "I.N.R.I." 1 2 3 4 Kidd, John (June 1988). "The Scandal of Ulysses". New York Review of Books. Retrieved 2010-07-13. ↑ Max, D.T. (19 June 2006). "The Injustice Collector". The New Yorker. Retrieved 2009-03-26. ↑ Battles, Jan (9 August 2009). "Budget Ulysses to flood the market". The Sunday Times. London. Retrieved 2009-11-30. 1 2 "75 Years Since First Authorised American Ulysses!". Dublin: The James Joyce Center (2006). ↑ De Grazia, Edward. Girls Lean Back Everywhere: The Law of Obscenity and the Assault on Genius. New York: Vintage (1992); p. 10. ↑ Gammel, Irene. Baroness Elsa: Gender, Dada and Everyday Modernity. Cambridge, MA: MIT Press (2002); pp. 252-53. ↑ Lyons, Martyn. (2011). "Books: A Living History." Los Angeles, CA: Getty Publications; p. 200; ISBN 978-1606060834. 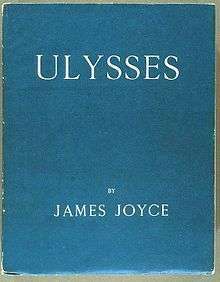 ↑ "Ulysses (first American edition)". James Joyce, Ulysses: The Classic Text: Traditions and Interpretations. University of Wisconsin at Milwaukee. 2002. Retrieved 2007-08-18. ↑ "Ireland set for festival of Joyce" BBC, 11 June 2004. Retrieved 2010-08-09. ↑ Eliot, T. S. (1975). "'Ulysses', Order and Myth". In Selected Prose of T.S. Eliot (London: Faber and Faber, 1975), 175. ↑ McSmith, Andy (2015). Fear and the Muse Kept Watch. New York: The New Press. p. 118. ISBN 978-1-59558-056-6. ↑ James Douglas of the Sunday Express, quoted in Bradshaw, David, “Ulysses and Obscenity”, Discovering Literature: 20th century. British Library. Retrieved on Bloomsday, 2016. ↑ United States v. One Book Entitled Ulysses by James Joyce,72 F.2d 705, 711(2d Cir. 1934). ↑ Jung, Carl. Ulysses: A Monologue. Translation by W.S. Dell of Jung’s Wirklichkeit der Seele, published in Nimbus, vol. 2, no. 1, June–August 1953. 1 2 Gilbert (1930), p. 22. ↑ Armstrong, Tim (2005). Modernism: A Cultural History, p. 35. Cambridge, UK: Polity Press. ISBN 978-0-7456-2982-7. ↑ Robertson, Campbell (16 June 2006). "Playwright of 'Dead City' Substitutes Manhattan for Dublin". The New York Times. Retrieved 2010-03-18. ↑ "Gibraltar", IrishRep.org, New York: Irish Repertory Theatre (2013). Retrieved on 2013-12-15 from http://www.irishrep.org/gibraltar.html. ↑ "The Modern World: Ten Great Writers: James Joyce's 'Ulysses'". IMDb. Retrieved 18 July 2012. ↑ "Reading Ulysses". RTÉ.ie. Retrieved 18 July 2012. 1 2 Williams, Bob. "James Joyce's Ulysses". the modern world. Retrieved 18 July 2012. ↑ "Frank Delaney: Archives". Blog.frankdelaney.com. Retrieved 2012-07-10. ↑ "James Joyce's Ulysses". BBC Radio. Retrieved 18 July 2012. ↑ Kellogg, Carolyn (6 April 2011). "After 22 years, Kate Bush gets to record James Joyce". Los Angeles Times. Retrieved 29 July 2013. ↑ "Crystal Castles – Air War". Genius. Retrieved 2016-05-26. Beebe, Maurice (Fall 1972). "Ulysses and the Age of Modernism". James Joyce Quarterly. University of Tulsa. 10 (1): 172–88. Ulysses, A three volume, hardcover, with slip-case, facsimile copy of the only complete, handwritten manuscript of James Joyce's Ulysses. Three volumes. Quarto. Critical introduction by Harry Levin. Bibliographical preface by Clive Driver. The first two volumes comprise the facsimile manuscript, while the third contains a comparison of the manuscript and the first printings, annotated by Clive Driver. These volumes were published in association with the Philip H. &. A.S.W. Rosenbach Foundation (now known as the Rosenbach Museum & Library), Philadelphia. New York: Octagon Books (1975).